Researchers detected unusually high levels of toxic metals, including the dangerous neurotoxin methylmercury, in a pristine coastal area and a saltwater tidal extension. This was surprising given there were no nearby industrial sites or other runoff pollution sites. They found that the toxic substances were leached by two unexpected sources: moulting elephant seals and bacteria. Typically, there are two major sources of mercury pollution in the water: either the substance is dumped directly in the water along with other chemicals by industrial processes, or the airborne mercury – again sourced from industrial processes, only his time released as flu gas or other types of emissions – gets absorbed by the ocean. All humans are exposed to some level of mercury. Most people are exposed to low levels of mercury, often through chronic exposure (continuous or intermittent long term contact). The inhalation of mercury vapour can produce harmful effects on the nervous, digestive and immune systems, lungs and kidneys, and may be fatal. The inorganic salts of mercury are corrosive to the skin, eyes and gastrointestinal tract, and may induce kidney toxicity if ingested. Particularly dangerous is a mercury compound called methylmercury which is neurotoxic and particularly damaging to foetuses and pregnant women. It all starts with the elemental mercury. Like mentioned earlier, it eventually ends up in the water or soil where it’s absorbed by bacteria. The bacteria then converts the mercury into the organic form, methylmercury, through metabolic processes. Methylmercury then bioaccumulates (bioaccumulation occurs when an organism contains higher concentrations of the substance than do the surroundings) and biomagnifies in the whole ecosystem. The bacteria might be eaten by small fish which in turn get eaten by larger predators and so on until the top animals in the food chain should see the highest concentration of methylmercury. This is why you may have heard warnings issued by the FDA or other government bodies suggesting to stay away from fish and seafood sourced from certain ‘hot spots’. California’s Año Nuevo State Reserve coast, however, has eight times more methylmercury than any other site on the West Coast. 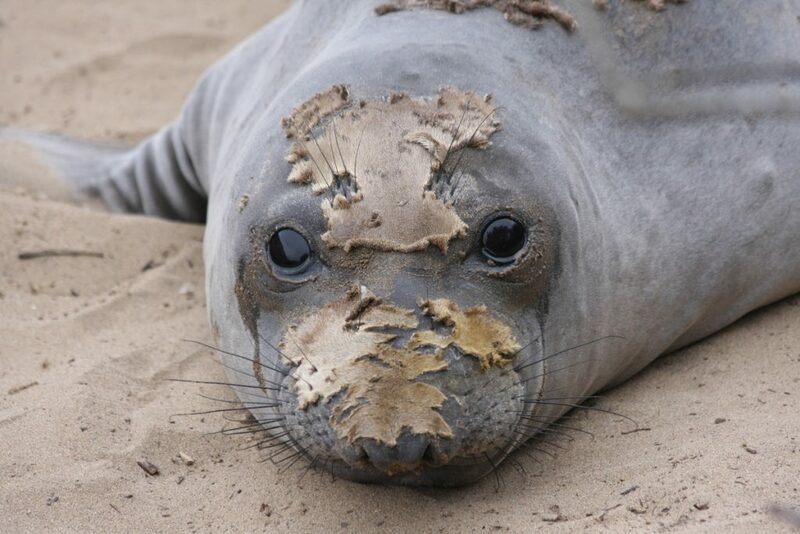 This has perplexed researchers for a while, until they noticed an interesting pattern: the methylmercury levels were relatively the same all year long apart from a peak which coincided with the elephant seal moulting season – when the animals shed their skin. Jennifer Cossaboon of San Diego State University in California analyzed the methylmercury levels in both the water and the elephant seals’ skin. The correlation was staggering seeing how the skin contained high levels of mercury. These seals typically live half the year in open water, and another half on the coast where they barely eat anything at all. While in open waters, the seals consumed contaminated fish whose mercury accumulated in their fur.